The European powers’ shared Christianity helped motivate them to not fight among each other over the new lands. The earlier history of Crusades had accustomed them to the idea of Christians – despite constant wars among themselves – unifying to fight nonChristians. Then they started explaining to themselves what principles they were following to avoid fighting among themselves. Explanations, justifications – principles – can take on a life of their own, far beyond the immediate context they were formulated for. We zoom in on the Continental Congress and see them signing the Declaration of Independence. 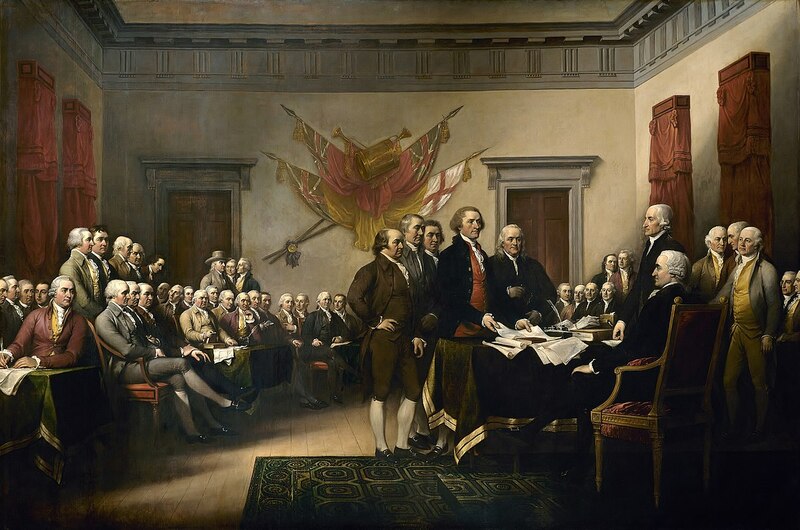 It says that the colonies are separating from Great Britain, and it explains they are doing so because all are created equal, and all are endowed with inalienable rights: rights of life and of liberty. Why explain? Why not just pick up the guns, organize the armies, and see if you win? Articulating a justification helped steel their resolve – and this was the justification they came up with. What was going on was that the rich, white, male landowners were feeling shabbily treated by Britain. The felt entitled to better. Why? "Well, um, . . . because we’re created equal, darnit! We have rights of life and liberty, too!" It was clear that “we” didn’t mean the indigenous people – which the Declaration of Independence refers to as “merciless Indian savages”; didn’t mean the African slaves, didn’t mean women, didn’t even mean nonlandowners. But once the explanation is out there, once a justification has been advanced, that justification takes on a life of its own. Scanning through US history, we notice that those principles, once declared, slowly, quietly, yet insistently kept nagging at Americans to mean what we had said. The principle keeps tapping us on the shoulder and saying, "Remember that thing you did, and you said I was the reason? Well, if I'm the reason you did that, then I'm also the reason for some other things you need to do." It takes generations of nudging, but it can happen. We see slavery ended. Then we see it take new forms in the sharecropping system, and in segregation and Jim Crow, and in mass incarceration. We see women get the right to vote. Then we see patriarchy adapting and continuing its subjugation. Yet we also see critics chipping away at those new forms – nagging, nagging with the principles of equality and liberty declared at the nation’s founding. And that’s a good thing. But if a good principle can push us to be better, a bad principle, also living beyond its original context, keeps making us worse. There are the European powers agreeing not to fight with each other – much – over the New World claims – and, uh-oh, they are explaining it to themselves. Whichever European power first conquered an area, it’s theirs, they explained. The rest of us will honor and recognize their possession. They call this the Doctrine of Discovery. As in: if you discovered it, you get to keep it. Of course, they didn’t discover it, they conquered it, but in their eyes the indigenous people didn’t count. For one thing, they weren’t Christian. For another thing, they weren’t developing the land to its best use. God’s creation cried out to be properly taken advantage of. The Doctrine of Discovery was not originally a tool used against indigenous people, because having steel, guns, germs, and Christianity, the Europeans needed no assistance of legal doctrines to complete their conquest. The Doctrine of Discovery was a tool the European Powers used on each other, so that European countries would recognize each others' claims. In other words, patriarchy is about men pitting themselves against other men – to get the ball, to score with it. Women don’t even rate to be players. It is, of course, a story as old as Helen of Troy – and recapitulated in the Mario brothers going after King Koopa to get Princess Peach. Likewise with the Doctrine of Discovery, the Native people don’t even rate to be players. It’s entirely about the relation of the European powers to each other. But having explained what they were doing, the explanation took on a life of its own. It became a principle going beyond its original function. We jump now to witness the Supreme Court deciding the case Johnson v. M’Intosh. Johnson inherited land, originally purchased from the Piankeshaw tribes. M’Intosh claimed the same land, having purchased it under a grant from the United States. The Court ruled in favor of M’Intosh on the grounds that under the Doctrine of Discovery, it was Great Britain’s land, which the American Revolution transferred to the US government. No one can purchase land from Native Americans because they don’t own it. It was “discovered” away from them. Johnson's continuing prominence is reinforced every year in law schools, where it is the very first case most beginning students read in their required course in Property. The best-selling property casebook calls Johnson 'the genesis of our subject' because it lays 'the foundations of landownership in the United States.' Given current sympathies for Native Americans, the outcome of the case has come to be viewed with disapproval in law school. 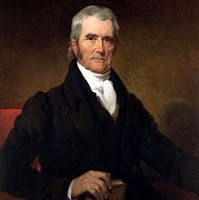 Johnson has joined Dred Scott v. Sandford and a few others to form a small canon (or maybe an anti-canon) of famous cases law students are taught to criticize. The leading casebook describes the philosophy underlying Johnson as 'discomforting' and quotes with approval the recent view of a law professor that Marshall's opinion 'was rooted in a Eurocentric view of the inferiority of the Indian people.' Johnson, though, might be the only member of this anti-canon that remains the law, and that is still cited as authority by lower courts several times a year. (Stuart Banner, How the Indians Lost Their Land: Law and Power on the Frontier, 2005). This is part 2 of 3 of "Discovering America"